Labor Day weekend is the official unofficial end of summer. It’s also the only three day weekend most people get before warm days start running out. The itinerary for the weekend was packed, starting with an impromptu offroad trip out of Boulder, a return to Fort Collins to gear up, and an 11th hour drive to the Red Feather Lakes area for a two night camping trip. This post is somewhat novel for this blog; here I’m featuring a few never-before-featured areas, as well as some familiar areas that have been featured before. Out of Boulder Canyon/highway 119, there are plenty of old roads to explore. Switzerland Trail is accessible via Sugarloaf Rd and Sugarloaf Mountain Rd, less than ten miles from Boulder up the canyon. Sugarloaf Rd climbs steeply up from highway 119 in the canyon, and is paved. Sugarloaf Rd mainly provides access for residents along it, but Sugarloaf Mountain Rd branches off to the north and provides access to public lands, the Switzerland Trail, and other opportunities. Early on Switzerland Trail westbound towards highway 72. It’s bumpy but nothing technical and even lower clearance vehicles can make it, though slower. I passed a Honda Civic and a Subaru Forester near the beginning. At the end of Sugarloaf Mountain Rd, there is a parking area as well as access to the Switzerland Trail. Left or due west here will take you towards highway 72 aka the Peak-to-Peak highway, and right will take you on towards Four Mile Canyon Rd and Left Hand Canyon Drive on the Switzerland Trail. For the first part of the trail heading west from the parking area, you are in the trees. Examine the map. The parking area at the end of Sugarloaf Mountain Rd is directly to the west of Sugarloaf Mountain (bottom right). There are two directions you can head on the Switzerland Trail from here. There are some spurs which lead up to old mines and such. Many of these spurs have good dispersed camping. And some are far more difficult and steep than the main road such that you will need 4WD and possibly low range. Obligatory beer pic. Taken from along one spur shortly in. A narrow section early on. We didn’t get to do the entire Switzerland Trail, since we headed due west from the parking lot. To truly do the entire Switzerland Trail, you will need to start or end at either the Peak-to-Peak highway or Gold Hill Rd (the southernmost and northernmost ends of the Switzerland Trail, respectively). This section of the Switzerland Trail, westbound from the parking area, gives you magnificent views to the south as you are essentially driving on the northern high ridge of the Boulder Canyon. Entering a section that will provide the best views this part of the trail has to offer. The end of Switzerland Trail is not far from here, and at a certain point turns into a well-maintained gravel road but residential on both sides until its western junction with the Peak to Peak Highway. From here, the next destination is Left Hand Park Reservoir, a high mountain reservoir accessible via an offroad trail spurring off of Brainard Lake Rd. Brainard Lake Rd ends at the Brainard Lake Recreation Area, a USFS managed recreation area with campgrounds, fishing, hiking, and more. Just before the toll booth, to the left (the south), the road to Left Hand Park Reservoir is signed. This reservoir is public lands and there is no entry fee to access it. A capable vehicle, however, is required. There are several non-motorized trails in the area, used in both the warm and cold months. Left Hand Park Reservoir actually sits a ways up the hill from the Brainard Lake area. On the access road, you’re going uphill towards the reservoir. There are some rocky sections that have potential to prove challenging if wet or muddy. Overall, however, the road is passable by most stock SUVs. 4WD is a plus, but low range is not required if it’s dry. The road to Left Hand Reservoir certainly requires high clearance in sections. This is an absolutely gorgeous reservoir with excellent views of the continental divide mountains. If you were to hike to the top of those tall mountains in the background, you could look northwest and see Lake Granby. Just to the due south is Rollins Pass, an offroad route and old railroad pass from Rollinsville (near Nederland) to Winter Park. The rest of the time up here was spent hanging around the reservoir and a short trip checking out the Brainard Lake area. Annual federal lands passes grant access to the recreation area, normally a small fee per vehicle. 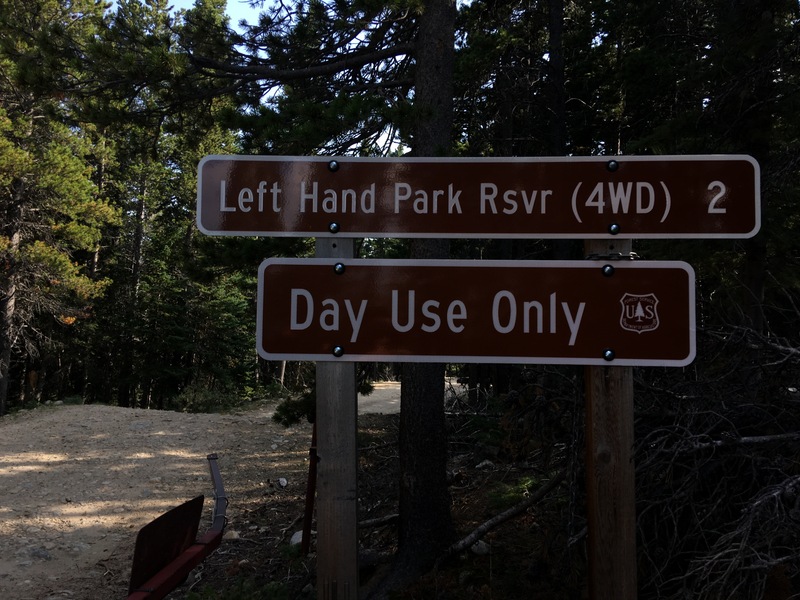 We didn’t go too far deep into the recreation area, but there are several picnic grounds, and campgrounds developed and maintained by the forest service. Brainard Lake from the southwest shore. Not a terribly huge lake. Brainard Lake is certainly not worth spending whatever the entry fee is just to see it. But if you’re camping or hiking it could be worth it. There are several trailheads in the Brainard Lake area that you can use to get to the top of some of those high mountains visible in the Left Hand Reservoir photo above. In the summer, the lake is also probably not bad to swim in, especially after a sweaty hike. Daylight was only a handful of hours left. Camping up here, it would be plenty. But next on the itinerary was heading back out of the mountains on the Peak to Peak highway, through Lyons, back to Fort Collins via U.S. 287, gearing up and heading to the Red Feather Lakes area to meet some friends already up there for a weekend of camping. The Peak to Peak highway is a beautiful highway, though and is conveniently located close to the Front Range cities. 11th Hour Drive to Red Feather Lakes, Dispersed Camping, Deadman Lookout, and Sand Creek Pass. I call this an 11th hour drive because it was nighttime when I got to the camp site. For those wondering how the hell I found them, you can obtain latitude and longitude coordinates on your smartphone, send them to someone if you can find cell service (which Red Feather Lakes has, and in fact, the campsite happened to have as well), and then that someone can put those coordinates into their phone and use that to navigate to the location. Note: I always recommend comparing the coordinates you get to an actual map of the area and making sure the location makes sense for a campsite (e.g. forest road, knowledge of the area). Notice in the photo above how it’s hilly, but all low-prominence rocks for a distance. This lower overall elevation (8k-ish ft) makes the Red Feather Area overall milder year round, and quite lush in the late spring and wetter summers. It’s possible to go up here in the middle of winter and find snow-free areas. More beer adventures. Seriously, if you’re of age, there’s nothing better than having a cold one while enjoying North America’s great outdoors. Sure beats the couch. After a day of hanging out and enjoying the nice weather and a little bit of freedom, the next stop was finding yet another campsite to check out, this time over in the 171 Network of roads and dispersed campsites. And I slept in my hammock. It was actually quite nice out all night. On Monday, we woke up to quite a change in scenery. From what the campsite looked like Sunday afternoon when we got there, it was quite a change. Smoke from wildfires in the Pacific Northwest was over Colorado today, and would stay around for several days. The visibility was drastically lowered and the air quality was not healthy for lots of outdoor strenuous activity. Visibility, however, improved throughout the day as the sun gained altitude. There was still very clearly a “fog” in the air. We decided to take a cruise up Deadman Rd to Deadman Lookout. It was clearer up there but you could still see the smoke was affecting visibility. On a good day, you can see Wellington, CO and Laramie, WY from the tower. On really good days, you can see Laramie Peak 102 miles to the north. I’ve visited Deadman Tower several times before, and have written a previous post on one of those adventures from last fall. This is the ‘Merica not enough people get to experience. It would seriously chill people out, if they just bothered to get out and enjoy some freedom. As a last little excursion, we decided to go check out Sand Creek Pass, an offroad shortcut from Deadman Rd. to Cherokee Park Rd. For reference, there are three major east-west through routes to get through the Northern Colorado mountains. From south to north, the Poudre Canyon (Highway 14), Deadman Rd. (County Rd. 86), and Cherokee Park Rd. (County Rd. 80C). They all roughly parallel each other until the Laramie River Valley. Poudre Canyon goes west over Cameron Pass to North Park/the town of Walden. Laramie River Valley Rd. (CR 103) cuts off Deadman Rd. and Cherokee Park Rd., and goes north-south between the Poudre Canyon and the town of Jelm, WY, where there is a cool old observatory. Hohnholz Lakes Rd. (200) is the backcountry route to get from the Laramie River Valley to North Park/Walden. Sand Creek Pass is overall a nice little offroad trail. It is very narrow in some sections, making passing difficult. There are plenty of pull-offs however. Dropping into Cherokee Park on Sand Creek Pass Rd. Sand Creek Pass Rd. is overall not that technical but has some fun water crossings and the descent north has lots of good jumps for dirt bikes or even mountain bikes. The road then opens up into Cherokee Park. At the area where Sand Creek Pass meets Cherokee Park Rd. there is a giant aspen grove. It is quite something else, and very amazingly pretty. We stopped here and found a spot to shoot some clays, and have another beer, before making the drive back to town. From here, the easiest route was taking Cherokee Park Rd. straight east where it will ultimately intersect with U.S. 287. Further down the road, the visibility was less than a mile due to the smoke. Overall, it was a jam-packed weekend full of adventure. Certainly quite the way to spend a Labor Day weekend. There are many spurs off of the main road of Switzerland Trail. Some of these are more challenging and steep than the main road. Also watch for mountain bikers because they’re common in the area.